We will be in ROOM D.
April 6 meeting is CANCELLED! Due to circumstances beyond our control, the April 6 meeting IS CANCELLED. Our next meeting will be Saturday, May 4. Location to be announced. See you on Saturday, May 4. April 6 2019 – Hearing Wellness – John. W. House, M.D. John W. House, M.D. is a board certified Otolaryngologist and Neurotologist with a private practice at the world renown House Providence Hearing Health Centers (formerly known as the House Ear Clinic and before that the Otologic Medical Group). His practice is dedicated to the diagnosis and treatment of hearing loss and related disorders and diseases. He is a Clinical Professor at both USC and UCLA. He has been president of many professional organizations, has received many honors and has been an invited speaker at many Departments of Otolaryngology in this country and Keynote speaker in many foreign countries. Many doctors of Otology from around the world have trained at House Ear Clinc. Dr. House has taken care of many famous and well-known patients including President Reagan, the King of Saudi Arabia, many movie personalities including Steve Martin. He will share with us today information regarding such conditions as Meniere’s disease, acoustic neuroma, tinnitus, SSHL (sudden sensori-neural hearing loss) among others. Come prepared to ask questions related to your hearing health. Light refreshments will be served. There will be a 50/50 drawing – winner gets 50% of the money collected on tickets sold for the raffle – this could be your lucky day!!! A $3.00 donation is requested to help defray the cost of CART. Join members after the meeting for a no-host lunch. Please note: Communication Access Realtime Translation (CART) will be provided; however, the loop system is currently being serviced and will not be used until further notice. The Hearing Loss Association of America – City of Orange Chapter (HLAA-COO) is a 501(c) (3) non-profit organization that provides information, education, support and advocacy for people with hearing loss, their families and friends. Your donations to our chapter are tax deductible. Our annual fundraiser is approaching soon! Get your team together. Or join the City of Orange team – Orange Hearos. AURAL REHABILITATION – What’s in it for YOU? Come to the next HLAA City of Orange meeting and find out how to maximize your hearing journey using aural rehabilitation. 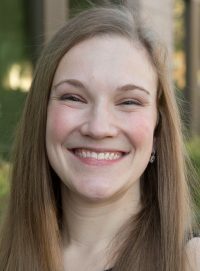 About our speaker: Ms. Eier is the Cochlear Implant Consumer Specialist with Advanced Bionics for the Southwest Region. She brings a wealth of professional experience to the field of hearing loss. She provides support, education and resources to CI candidates, recipients and professionals and has been with Advanced Bionics since 2015. Prior to her tenure at Advanced Bionics, Ali worked as a teacher for the hearing impaired and as a bilingual early interventionist. Angel SoundTM is a PC-based interactive listening rehabilitation program developed by TigerSpeech Technology and freely distributed by Emily Shannon Fu Foundation, a non-profit organization dedicated to honoring Emily Fu, our angel and beloved daughter. Emily help us to realize that while life on earth may be temporary, love is forever, and helping others is life’s true meaning. Dr. Rose will show us how to access features on an iPhone to make hearing more accessible. Light refreshments will be served. There will be a 50/50 drawing – winner gets 50% of the money collected on tickets sold for the raffle – this could be your lucky day!!! CART provided. Get together for lunch at Marie Callenders after the meeting. Marla Peoples at 714-400-7992 or Email: hlaa.cityoforange@gmail.com. Photos from a rainy day meeting Saturday January 5, 2019. 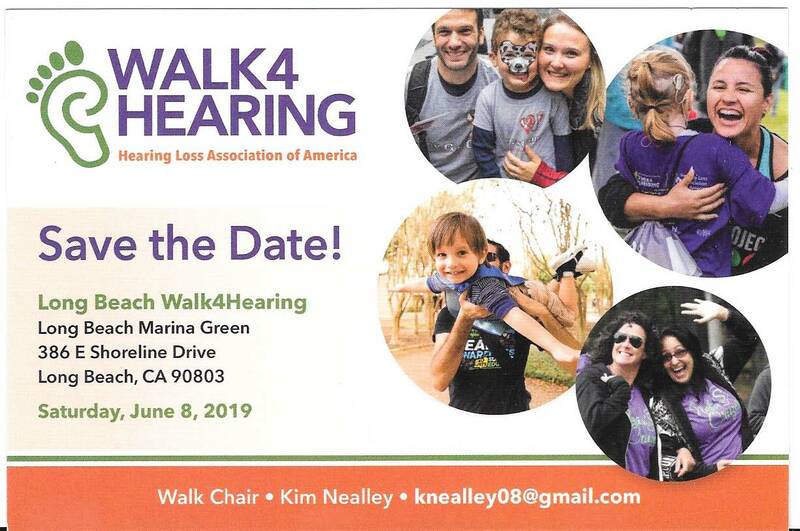 Join the City of Orange chapter’s team and Walk4Hearing on June 8, 2019. Jennifer Dentino is a certified Animal Behavior College dog trainer. 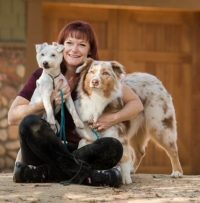 Dentino is an instructor at 2 training facilities (Jump Start and Courteous Canines) – she will share her wealth of experience in canine training, including deaf dogs. She holds her ASCA Novice Rally Obedience title and several ASCA Agility tiles. Her deaf dog Kaos is a Pet Prescription Team Therapy Dog who earned a Canine Good Citizen title and has completed 100 + therapy dog visits since being certified in 2015. Light refreshments will be served. There will be a 50/50 drawing – winner gets 50% of the money collected on tickets sold for the raffle – this could be your lucky day!!! A $3.00 donation is encouraged to help defray the cost of room rental and CART. Join members after the meeting for a no-host lunch. Come Ring in the New Year with HLAA City of Orange. Our very own Toni Barrient will present on A Guide to Purchasing Hearing Aids–“The Consumer Checklist. ” if you are considering the purchase of a new hearing aid in 2019 you will NOT want to miss this meeting!! Light refreshments will be served. There will be a 50/50 drawing – the winner gets 50% of the money collected on tickets sold for the raffle – this could be your lucky day!!! Please note: There will be CART provided; however, the loop system is currently being serviced and will not be used until further notice. The Hearing Loss Association of America – City of Orange Chapter (HLAA-COO), is a 501(c) (3) non-profit organization that provides information, education, support and advocacy for people with hearing loss, their families and friends. Your donations to our chapter are tax deductible. TOPIC: Toni Barrient will discuss the PROCESS of purchasing hearing aids. This is the same place that our chapter had the 2018 Christmas luncheon/party and will be held in the same room at the back of the restaurant. We have the room reserved for a non-refundable deposit of $50 – the chapter will provide light refreshments to include coffee and water. Your donation towards this room rental is greatly appreciated. Some people in attendance will stay for lunch there at the restaurant after the meeting – if you want to do so please let Marla Peoples know (so she can make a reservation) by contacting her at hlaa.cityoforange@gmail.com or text to 714-400-7992. We look forward to seeing you at our next meeting on January 5, 2019. Remember we have a new TEMPORARY location at Marie Callendar’s.